NEW YORK—Sending a message that they would no longer stand for dismissive treatment and inflated payrolls, owners from all four major U.S. professional sports leagues voted Wednesday to unionize. “We the owners have been exploited for too long, and with unionization, we can secure the basic rights we’ve never had as individual owners of major-market sports teams,” said Cowboys owner and union representative Jerry Jones, who issued a demand that the players immediately recognize the owners’ union and come to the table to negotiate for more fair and equitable ownership terms. “Today, we stand in solidarity with all the sports owners around the world who have been taken advantage off, forced to hand out guaranteed contracts while living without basic jet fuel reimbursements and guaranteed spa days. 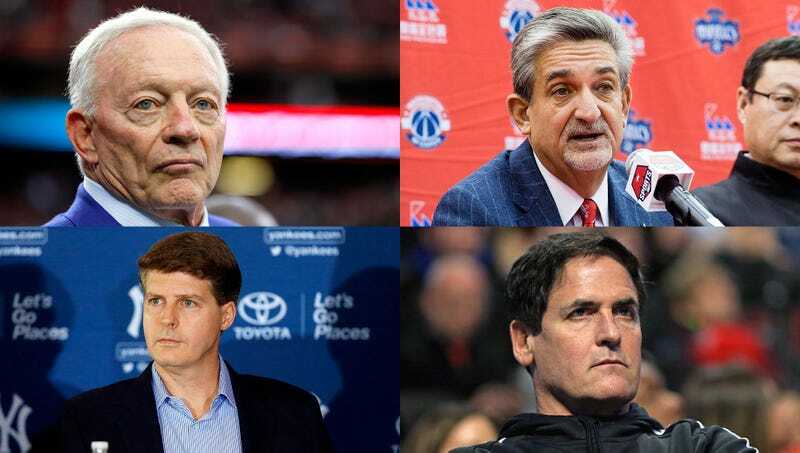 Separately, we’re just a bunch of millionaires and billionaires, but when we work together, we can finally wield some power.” At press time, thousands of fans took to social media to express their overwhelming support for the owners in their fight against money-grubbing athletes.